The right cast can make or break a film, and in some cases, the casting can even elevate a bad film. Films with phenomenal casts always pique interest, and generally warrant a watch without question. It takes a great script and (usually) a great director to employ an all-star cast; however, when it's done effectively, the result is instant cinema gold. Cast includes: John Travolta, Uma Thurman, Sam Jackson, Bruce Willis, Tim Roth, Harvey Keitel, Christopher Walken, Ving Rhames, Steve Buscemi, Eric Stoltz, Rosanna Arquette. Quentin Tarantino is a modern master of assembling phenomenal ensemble casts, and 1994's Pulp Fiction is a testament of Tarantino's casting prowess. With Pulp Fiction, Tarantino assembles an A-list cast that enhances the film in all respects, including the likes of the up-and-up Samuel L. Jackson and Uma Thurman, in addition to seasoned veterans Bruce Willis and John Travolta, whose career was revitalized due to the film's success and acclaim. It's hard to picture anyone else playing these characters, even though not all of them were first choices — Michael Madsen was initially optioned for Travolta's role, but passed to be in Wyatt Earp — because they really bring Tarantino's unique and quirky characters to a whole new stage of being with their singular performances. Cast includes: Nicolas Cage, John Malkovich, John Cusack, Steve Buscemi, Ving Rhames, Danny Trejo, Dave Chappelle, Colm Meaney, M. C. Gainey. Regardless of how you feel about Con Air, one thing's for sure: the casting is superb and stacked with solid A to C list actors. The actors are in on the film's absurdity and play directly into the schlock, particularly Cage, whose southern accent spans the laughable to the oddly charming. Strengthened by Malkovich's terrifyingly articulate villainy and peppered with entertaining performances from a multitude of action cinema's repeat offenders, Ving Rhames, Danny Trejo, and M. C. Gainey, Con Air still holds up as an over-the-top thrill ride. Cast includes: Mark Wahlberg, Julianne Moore, Heather Graham, Burt Reynolds, Philip Seymour Hoffman, John C. Reilly, Don Cheadle, William H. Macy, Luis Guzman, Thomas Jane, Philip Baker Hall. No one really utilizes casting quite like Paul Thomas Anderson, and Boogie Nights is probably his most notable example, aside from Magnolia, which is also a great 90s cast but not quite a monolithic as Boogie Nights. Anderson often times finds actors who are, in many ways, the living embodiment of his characters, and with Boogie Nights, he plays upon Burt Reynolds' misogynistic stigma and Mark Wahlberg's looks and seeming innocence with wonderful effect, much in the same way he'll later use Tom Cruise and Adam Sandler. Re-creating an ethos for an an era is no easy task, and PTA is able to achieve this with potency using his brilliant screenplay, strong visual literacy, and excellent casting. Cast includes: Val Kilmer, Kurt Russell, Sam Elliot, Bill Paxton, Powers Boothe, Charlton Heston, Billy Bob Thornton, Thomas Haden Church, Micheal Rooker, Billy Zane, Robert Michum. 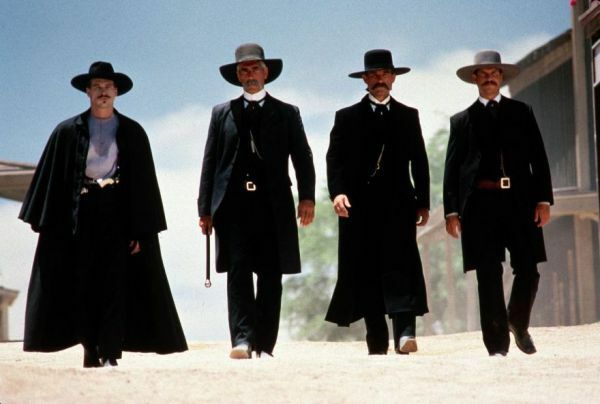 Tombstone is pure western gold, and the film brings to the screen a remarkable cast of tough-guy personalities that gel with sublime effect. Not only does the film have a fantastic cast teeming with all the right personality, but it also contains several definitive performances for those involved — it's really hard to not see Val Kilmer or Kurt Russell and not have their performances in Tombstone pop into the back of your mind. Cast includes: Robert De Niro, Al Pacino, Val Kilmer, Natalie Portman, Ashley Judd, Jon Voight, Tom Sizemore, Danny Trejo, William Fichtner, Wes Studi, Tom Noonan, Hank Azaria, Henry Rollins, Jeremy Piven. Michael Mann assembles and all-star cast of big names and strong supporting personalities for his operatic heist epic. The film's high level casting achievement is finally bringing De Niro and Pacino together in a scene for the very first time, but it's peppered with quality performances from a multitude of stars ranging from Natalie Portman to Val Kilmer and Tom Sizemore. It's a pitch perfect cast and they bring their A-game, which aide the visceral aspect and elevate the drama with punching force. Cast includes: Sean Penn, Jim Caviezel, George Clooney, Nick Nolte, Adrien Brody, Woody Harrelson, John Cusack, John Travolta, Jared Leto, John C. Reilly, Thomas Jane, Nick Stahl, Tim Blake Nelson. A highly stacked cast rendered in an overly long meditative poem that fizzles out at the end, but isn't without its affecting moments. Sean Penn turns in a savage performance as the embittered Sergeant Walsh that is counterweighted by Jim Caviezel's calm and collected performance, while figures like George Clooney, John Travolta and Nick Nolte sprinkle the film with even more stardust. However, a lot of potential star power and effect seems to have been left on the cutting room floor with this one. What do you think? What's your favorite cast from a 90s film? We want to know. Share your thoughts and feelings in the comments section below, and as always remember to viddy well!